Are new FHA loan limits a cause for concern? As 2014 begins, another policy holdover from the Great Recession has bitten the dust. The Federal Housing Administration’s (FHA) loan limit increases that were introduced in 2008 have expired, meaning prospective borrowers in some areas will have to turn elsewhere to obtain a single-family mortgage exceeding the new limits. Nationally, the impact is relatively minor, but a closer look at the numbers reveals disproportionate effects in several regions. My colleagues Laurie Goodman, Jun Zhu, and I explore the impact in greater depth in a new commentary. How exactly did the limits change? In low-cost regions, they remained at $271,050. In moderate cost regions, the loan limit is determined by a multiplier of the median house price, which dropped from 125 percent to 115 percent. In high-cost areas, an absolute ceiling determines the limit, even if median house prices would yield a higher number. That ceiling dropped 14.3 percent, from $729,750 to $625,500. The new limits should not worry the vast majority of prospective borrowers. Had the changes occurred two years ago, only 2.95 percent of the FHA loans made in 2012 and 2013 would have been affected. But that national figure masks significantly greater impact in specific locations. As shown in the map below, the impact is most dramatic in the Northeast and Southwest. The disproportionate effect is due primarily to two details buried in the calculation methodology that magnify the modification to the absolute ceiling and median house price multiplier. Sources: CoreLogic Prime Servicing database and Urban Institute. Note: Number of affected borrowers was determined by computing the total number of FHA originations in each MSA in 2012 and 2013 where the origination balance exceeds the 2014 loan limit for that MSA. First, as exemplified by Salt Lake City, changes by the Office of Management and Budget in Metropolitan Statistical Area (MSA) boundaries generated some outsize effects. The loan limit for all counties in an MSA is based on the median house price in the highest-price county. With high-priced Summit County now excluded from the Salt Lake MSA, the loan limit plunged by 58 percent. Second, as demonstrated by Riverside-San Bernardino-Ontario, CA, where the loan limit fell 29 percent, MSAs in which house prices decreased enormously after 2007 were disproportionately affected by a switch to more current (and far lower) house prices as the base of the limit. 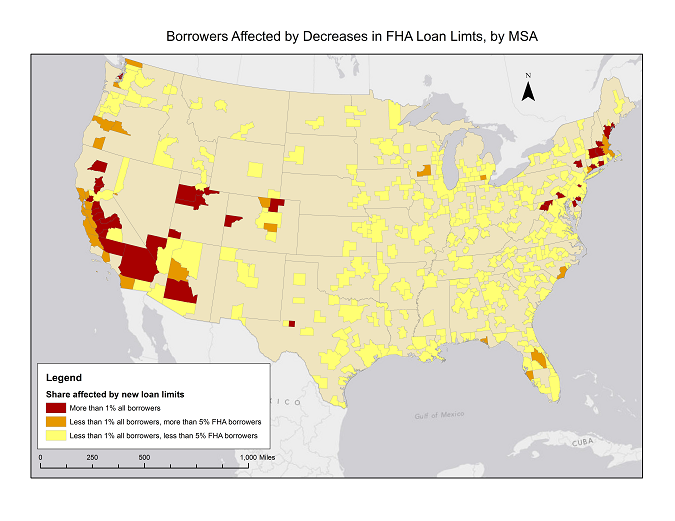 Furthermore, where the loan limits dropped sharply and the FHA share is high, more prospective borrowers are affected. These are the areas shown in red on the map above. In Salt Lake, 10 percent of FHA borrowers would have been affected, and 23.8 percent of new loans in Salt Lake were FHA-insured, meaning 2.4 percent of all borrowers in the MSA would have been affected. Worcester, Massachusetts experienced a 26 percent decrease in the loan limits, not quite as dramatic a drop as Salt Lake. However, that decrease would have made 14.5 percent of Worcester’s 2012-2013 FHA loans ineligible for insurance in 2014. Combined with a 16.2 percent FHA share, the overall portion of Worcester borrowers affected is similar to the portion in Salt Lake. Our commentary also explores the effect at the Census tract level. Some neighborhoods in Southwest and California MSAs may be severely impacted by these changes. For example, in one Riverside Census tract, 18.7 percent of 2012-2013 borrowers would have been affected. The most heavily impacted tracts tend to have large minority populations, and the changes in these areas will predominantly affect minority borrowers. Much of what the FHA did was directed by statute, but it does have some ability to correct unexpected problems. We suggest taking another look at places where the changes affect an outsized proportion of potential borrowers and consider measures to alleviate the impacts in those areas. If my FHA spending limit is 355,000 can I purchase a home at 375,000 with a 20,000 down payment?